Rough and worn in, scratchy and diffident, Triplicate continues Bob Dylan’s extended love song to the great crooners of the last century. The sweep of this new album is broader in scope and size than that of previous releases Shadows In The Night and Fallen Angels, which were essentially limited to new interpretations of songs associated with Frank Sinatra. Stretched out comfortably over the course of three CDs, the songs on Triplicate reflect the same era of American music with Dylan putting his unique spin on “Stardust,” “You Go To My Head” and “These Foolish Things” and other film and Tin Pan Alley classics. It’s safe to say that none of these songs have ever been arranged or sung before in anything like the way Dylan has envisioned them. No one else would dream of singing these songs like he has. 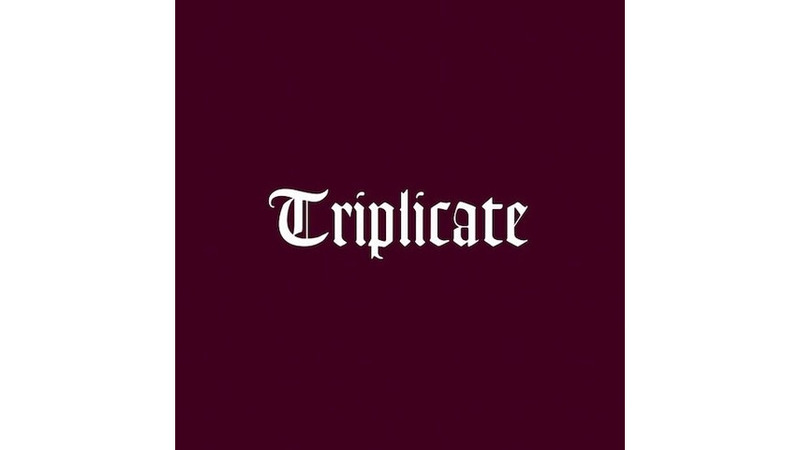 Yet, as idiosyncratic and unmistakeable as the singer’s approach is; as undeniably “Bob Dylan” as each song sounds, the performances he captured for Triplicate represent, at the same time, the most naked and ego-free music he has ever recorded. The approach to recording the songs selected for this new collection follows the same intimate pattern that Dylan employed for the first two tribute albums. The music was arranged for a small group ensemble formed by the core members of Dylan’s touring band. The playing is relaxed, yet assured with Tony Garnier’s enigmatic bass lines and Donnie Herron’s visionary pedal steel textures setting the tone and color of each song. Every one of the performances on Triplicate is heartfelt, exquisite and more than a little battered. When he sings “You must remember this/a kiss is just a kiss,” you feel the weight of every syllable and word. Each lyric is fully considered and savored before it is finally released. Even though many of the songs in this set such as “There’s A Flaw In My Flue” are replete with a kind of world-weary humor, there is nothing trivial or kitschy here. Dylan perfectly balances his reverence for the material with a seemingly casual and relaxed approach that makes it easy to imagine he recorded the album by sitting down at the piano with The Great American Songbook in front of him, flipping the pages and singing each of these songs as if for the first time. It’s easy to get distracted and argue whether our noisy, overcrowded world needs another recording of “Stormy Weather” or “As Time Goes By,” but for some people, this might be the first time they will have heard these songs; they may never have listened to Sinatra, Dooley Wilson, or any of the other singers these songs are usually identified with. And, even if you concede the value of keeping these songs alive, you might ask whether they mightn’t be better preserved for posterity by Michael Buble or Diana Krall, singers capable of presenting them in a style that more resembles their original versions. Such a perspective completely fails to pick up on the nuanced approach Dylan brings to his performances. Embedded in each phrase he sings is a suggestion of something deeper that goes to the core of the essential nature of music itself. Besides, not all art is pretty, and nothing human beings have created has ever been left alone, immutable and immune to interpretation. The gritty edge that Louis Armstrong laid onto some of Cole Porter’s smoothest love songs changed them into something deeper and more satisfying. The way Glenn Gould interpreted Bach was nothing short of heretical, and Jimi Hendrix’s take on “All along the Watchtower” is by no means ordinary. There are many paths to the top of the mountain, and there are thousands of ways to sing a song. Because Bob Dylan is one of a very few songwriters who has created original works equal to the standards he is interpreting, he is able to sing with an intimacy and spaciousness that only comes with having nothing to prove. The songs on Triplicate are ones that he had the chance to consider over his long and varied lifetime. It’s fortunate, then, that he’s chosen to share them, when he just as easily could have sung these songs at home in his living room. It would be understandable had he kept his relationship with this music private. Instead, Triplicate allows us to experience the rare and intimate pleasure of listening to an artist connect with, and express the subtle and infinite joys suggested by a great song. For more from Bob Dylan, check out this performance from 1988 in the player below.